Tomorrow’s classrooms will be collaborative workspaces, featuring 3D printers, “immersive” work stations and hybrid textbooks in which content is generated on the fly. If you want to see the future of education then you don’t have to invent time travel, just take the escalator to 4.2 at the Frankfurt Book Fair where you can step into the classroom of the future. 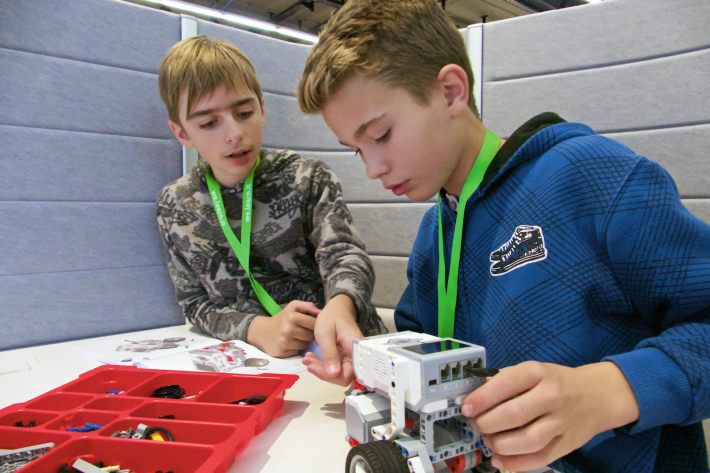 In this vision of the future, small groups of children work messily together on a number of “expeditions” to create amazing machines out of LEGO, scan seashells to be printed in 3D to help them explore under the sea, and tell their own stories using sound. By using the latest technology, such as 3D printers, fully immersive work stations—which are rather like working on two screens with one of them a touch screen projected onto the table in front of you— and hybrid text books, it’s hoped that teachers and publishers will be shifted from being providers of information to being supporters and prompters of the learning experience. The hybrid textbook is much like a traditional textbook with text and pictures but also connects to a world of student-, teacher- and publisher-generated digital material with the wave of a smartphone over an invisible watermark. This, its creator Hewlett Packard believes, will help the students of today prepare for their own future in the knowledge economy — if in a rather controlled way that keeps parents and teachers happy. “This is the fourth edition of our classroom of the future,” says Martina Wolff de Carrasco, Manager Vertrieb Bildung at the Frankfurt Book Fair, whose vision this concept originally was. Each year, she works with partners like Vitra, ELIG.org and Hewlett Packard to deliver it anew. “The goal is to show that education can be innovative and international, and publishers can find new ways of delivering material in the future. “The first two years focused on the use of 3D technology in scientific education. This year, the classroom of the future demonstrates other aspects of innovative learning such the hybrid textbook and how nicely-designed spaces by Vitra can have a direct impact on how much time you want to spend in a room, how you learn — and even how you think.